“It is a change in you. You have to ask yourself reflective questions. What is the value of my new managerial role? How does my new role fit in with the output of the team? What do I care about? What is important to me? Is there connection between what I care about and the value of my new role? What new behaviors and habits do I have to develop to be effective in my new role? 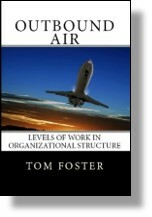 This entry was posted in Accountability, Leadership and tagged managerial leadership, role, value for the work on March 20, 2017 by Tom Foster. “But he has been doing a terrible job, as a Manager,” Cheryl observed. “So, do you want him out of the company? Should he be gone?” I asked. “So, what is the one thing you have to do, to make this move successful?” I pressed. This entry was posted in Accountability, Organization Structure and tagged accountability, manager, role on August 11, 2015 by Tom Foster. In our company, we have a Stratum II (S-II) sales role, 3-12 months time span. In that role, we have a person who has demonstrated solid S-II effectiveness at around 9 months in the role. Our lead time on proposals along with the length of the sales cycle feels about right. In the past year, I have been trying to get our salesperson to think out a bit further. Sometimes, we find that we are not on the short list for some RFPs because our competitors have already established a better relationship. In some cases, our competitors have been courting the prospective client for three to four years, way before a project was even on the horizon. I am thinking about adding a Key Result Area (KRA) to our sales role called Client Development and calibrating it at a three year objective. To create client relationships up to three years in advance of a prospective project. It’s a really small industry, so we know who the real players are across the country. We just need to get to know them sooner. When I proposed this to our salesperson, I didn’t get outright rejection, but she said she would be more effective focusing on projects that were real instead of wasting her time on something that might never happen. Problem is, when they do happen, it’s too late to establish the relationship. We are already off the short list. I can see Client Development as a valuable KRA for this role. And I can see the time span of the objective as appropriate to accomplish what you want, to create the kind of long-term relationship to ensure you make the short list. If you examine your competitors, that is exactly how they are defining the relationship work and they are beating you to the short list as a result. Understand, however, when you define the level of work at 3 years, you have moved the level of work from S-II to S-IV. That is a totally different level and may be beyond the capability of your solid S-II salesperson. Your observation of push-back would make me suspicious that simply changing the role description is going to elevate the behavior. Moreover, if establishing the prospective client relationship is a 3 year time span task at S-IV, you also must consider that the person you are establishing this relationship with, is also thinking 3 years out. It might be a more appropriate time span task, a more appropriate client relationship for you. This entry was posted in Time Span and tagged role, time span on October 27, 2014 by Tom Foster. I was hired into the company six months ago, in a managerial role. One of my team members, a supervisor, was promoted beyond his capability. It’s a mess, but a mess that I inherited. This guy is not a bad person, he means well, just over his head. Oh, did I mention, he’s related to one of the Vice-Presidents? You are doing no one favors by leaving this person in a role where they consistently underperform, no matter who they are related to. This person may be doing their best, but pace and quality suffers. The fix is managerial work for you. Your options range from modifying parts of the role to a complete reassignment to a different role. If you intend to modify the role, you will need to break it down into Key Result Areas and determine which parts of the role are done well, reassign the rest to someone else. In your assessment, take a look at the history of this person, what were their previous positions and how well did they do? Everyone has competence, somewhere, you just have to find it. The political part, being related to a current VP, will require some finesse, but will likely be easier than you think. If you truly have a chocolate mess on your hands, everyone already knows it, they just don’t talk about. And yes, the VP knows it, too. You will be doing the VP a favor if you can determine a more suitable position. This entry was posted in Accountability and tagged performance, role, roles, task assignments on August 22, 2012 by Tom Foster.